The most popular route is Harwich to Hook of Holland. The average price this month for this route is £77.50 for a car and two people each way. Holland is one of our most popular countries. For peak season sailings, please book as soon as possible. 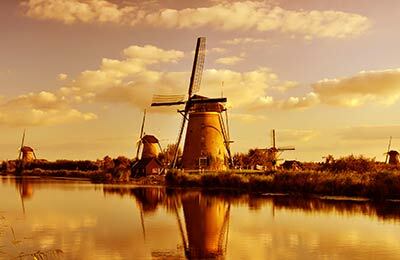 The Netherlands is simply one of the must-see countries of Europe. From the canals of Amsterdam to the flat expanses of fields and flowers out in the countryside, there are so many reasons to take a ferry from the UK to Holland. Booking a ferry to Holland couldn't be easier with AFerry with our selection of travel options and broad comparison of the best deals. Which Companies Offer a Ferry to Holland from the UK? Stena Line have up to two ferries to Holland from Britain every single day, while P&O Ferries and the Scandinavian carrier DFDS Seaways both boast up to seven ferries to Holland from the UK every week. Choose your ferry from UK to Holland wisely and you could save time and money, some crossings are under seven hours from port to port. Whatever ferry from UK to Holland you go for you can be sure of the best deal with AFerry. More strictly known as the Netherlands, Holland is famous for its night life, colourful culture and liberal outlook on life. 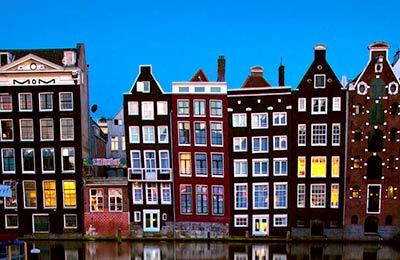 Despite being a small country, it has many famous cities, including Rotterdam, Amsterdam and the Hague. The Netherlands has invested a lot in its public transport system, and travel by train is easy both between cities and within cities. Travel by bus is also a useful way of getting around cities and reaching smaller villages. Tickets are generally very reasonably priced and in many big cities, public transport runs right the way through the night. In many big cities, public transport runs right the way through the night. Train tickets must be purchased before travelling - purchasing on the train will involve the full price of the ticket and a 35 euro fine. Like in many other European countries, you must validate the ticket before travelling by stamping it with the machines provided on the platform. There is no reduction in price when tickets are bought in advance. If you wish to visit more remote places of Holland, the car is a useful method of transport. Roads in the Netherlands are safe, though often heavily used during the week. Dutch police are very vigilant when it comes to the issue of speeding, and the fines are often expensive. Many petrol stations are open 24/7 and accept all common credit cards. There are many things to see in Holland. Famous sites include the canal system and the picturesque range of windmills and country villages, which are often surrounded by fields of flowers. When the Euro Cup or World Cup is held, the country gets transformed. About half the population can be depended on to watch the game in the country's bars and cafés, and it's a good experience to share. The country claims to have a party for every day of the year and you can find a party for the day of your choice by going onto the PartyFlock website. Madurodam is a model city (yes, model city, not model village) in the Hague, and has miniature replicas of all major Dutch towns and cities, as well as working models of boats, cars and trains. This makes the world's largest model railway a must-see attraction. In the Summer of 2011, they are also showing a model laser show of the Dutch battle against the elements. Yes, Madurodam is a model city, not model village! AFerry offers the best way to find the cheapest ferry routes to Holland with its easy to use booking form. Begin your holiday on a ferry and start relaxing straight away!